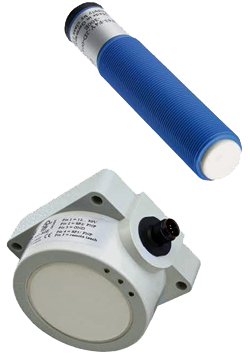 Ultrasonic level sensors measure the clearance between a liquid level and the sensors’ transmission surface using the echo time measurement of an ultrasonic signal. Liquid levels can be measured and the data sent to master evaluators by means of a programmable current or voltage output. For operating ranges up to 2m, the devices are available in an M18 enclosure including two lock nuts that is easy to install. For an operating range up to 3.5m, we offer an M30 enclosure. The sensor with 6m operating range has an enclosure with square flange and an extra large transmission surface. FUM10 ultrasonic level sensors are suitable for applications where liquid levels in depressurized vessels are monitored, measured or regulated.